Blackville School students from grades five to twelve attended a special presentation on Wednesday morning, February 2. Two representative from Free the Children, Sarah Klassen and Derrick An, presented H20 4U - a presentation and workshop focusing on global water use and conservation. Blackville was one of only ninety schools in Canada that was selected and received sponsorship for this presentation through the Royal Bank of Canada. During the presentation, the students were told that tap water in Canada is usually safe to drink and bottled water should be avoided. Six times more water than is actually in a water bottle is used to manufacture the bottle. 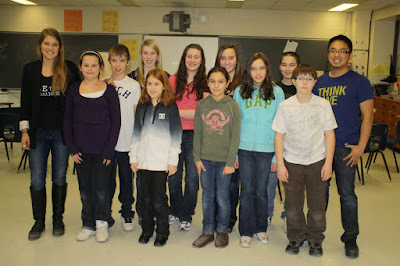 Following the presentation, twenty five students from grades five to nine attended workshops to develop a plan of action for Blackville School and decide on a village in India that the students would adopt and help support them in their efforts for clean water through awareness and fund raising.